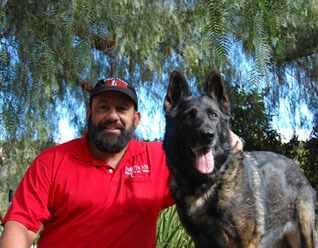 Kim S. - Dog Trainer in San Diego: The Dog Man Can. Dog Trainer in San Diego: The Dog Man Can. Home → Testimonials-widget → Kim S.
I have been a Pro-Train client for 7-years. I have severe cerebral palsy and a 95% vision loss. Mr. Castillero custom trained a beautiful Black Lab named Scooby, who courageously guided me from a motorized wheelchair until he retired April, 2011 at age 9. 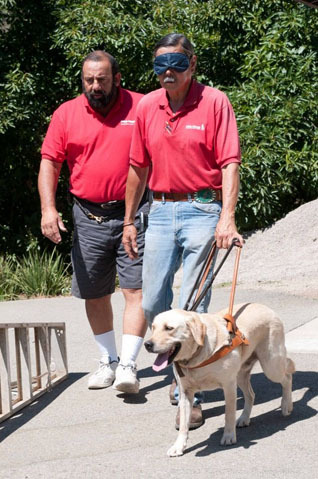 Scooby and I were the first certified wheelchair guide dog team in the Western U.S. His successor Captain, a rescued Yellow Lab mix is even more remarkable. Captain was rejected by 3 previous owners because he barked uncontrollably at anything that moved, jumped fences, and chewed everything in sight. Mr. Castillero’s extensive knowledge of canine behavior and innovative training methods transformed this out of control fearful dog, into my confident working guide. Before acquiring Scooby and Captain, I was home bound for 8-years. Severe arthritis in my shoulders prevented me from using a white cane to travel independently which I had done for 25-years. Mr. C. restored my ability to travel independently and gave me physical confidence I never experienced until I worked with my guide dogs. His intensive private in-community instruction and excellent coaching with a touch of good humor prepare you and your dog to function successfully in any situation. Unlike nonprofit service dog providers that produce dogs like xerox copies, then hurry you through a program and don’t guarantee a person receives a dog at the end of their handler’s course. Mr. C.’s excellent service continues throughout a dog’s life. He responds to his client’s questions or solves their dog’s behavior issues promptly and courteously. Most of all, I was treated with dignity and respect.